As promised many moons ago when I revamped my blog, although I no longer have a regular travel feature, I will occasionally share any travel adventures I do have. 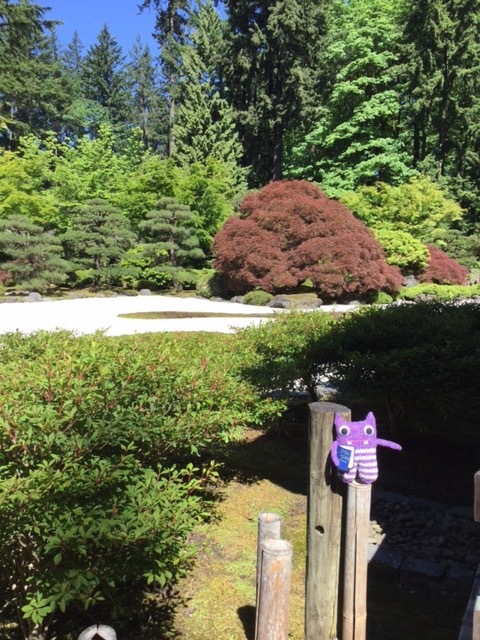 Last week was my birthday and to celebrate I decided I’d take a tour of Portland’s Japanese Garden. While I do love gardens, there were a few ulterior motives behind this choice. First, it was free thanks to the Cultural Pass from my local library; second, it was only a short hop away from where I wanted to have a birthday pint; and third, I was hoping to get a few reference photos for future art projects. Oh, and last but not least, I had a new friend who had recently moved to Portland from Ireland and wanted to see a few sites in his new home. Look at that face. how could anyone resist him? Finn McSpool was born in Dublin with the name Leabhar Beastie (leabhar is book in Irish and pronounced a bit like glower without the G). 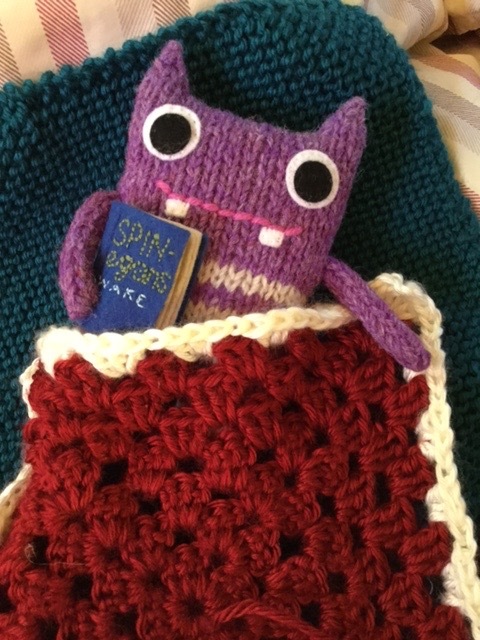 He was wonderfully handcrafted with 100% Irish wool by the pun-loving Helen Crawford of CrawCraft Beasties. 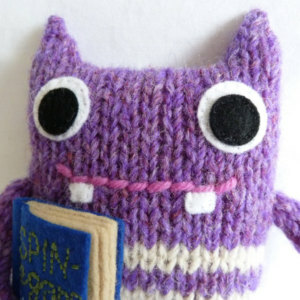 I first caught a glimpse of Leabhar Beastie on Helen’s blog, then adopted him when he popped up on her Etsy shop. 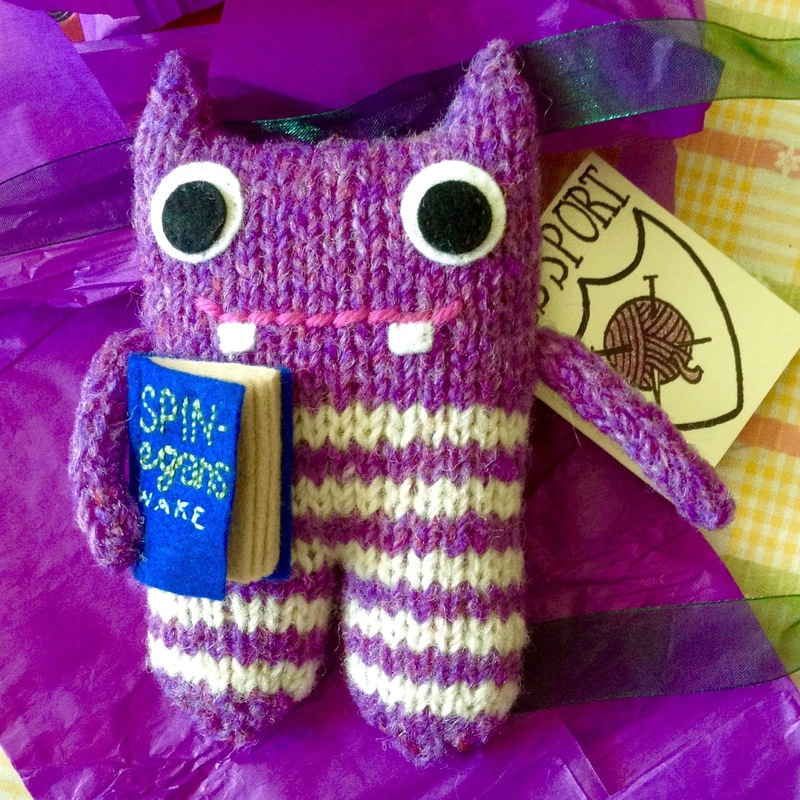 Leabhar Beastie arrived with passport in hand and soon earned a new name inspired by Irish myth. 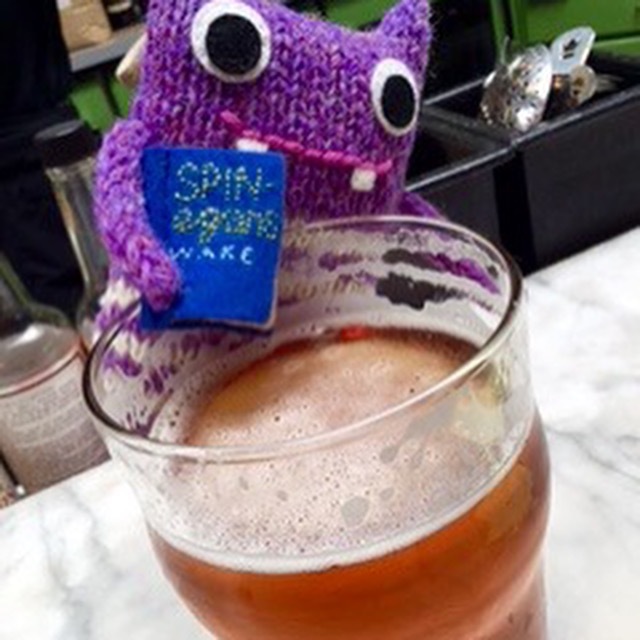 Although he’d only been in town a day, Finn wasn’t about to let jet lag keep him from a day out in Portland. 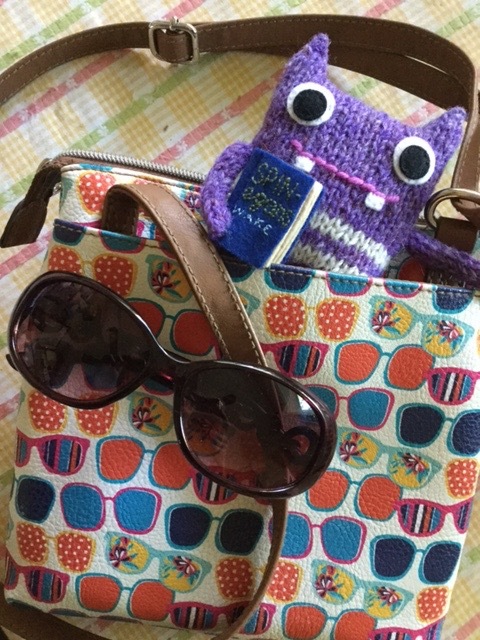 He jumped in my handbag without hesitation and was ready for some adventures. Portland’s Japanese Garden, designed by Takuma Tono, was started in the early 1960s and opened to the public in 1967. 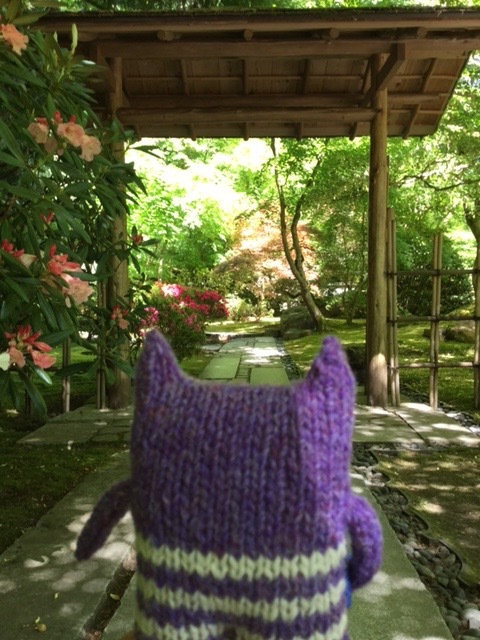 As far as public Japanese gardens go, it’s not too shabby. In fact, the Japanese ambassador even said, “I believe this garden to be the most authentic Japanese garden, including those in Japan.” Impressive, no? The gardens consist of five “theme” gardens and Finn McSpool was eager to see them all. 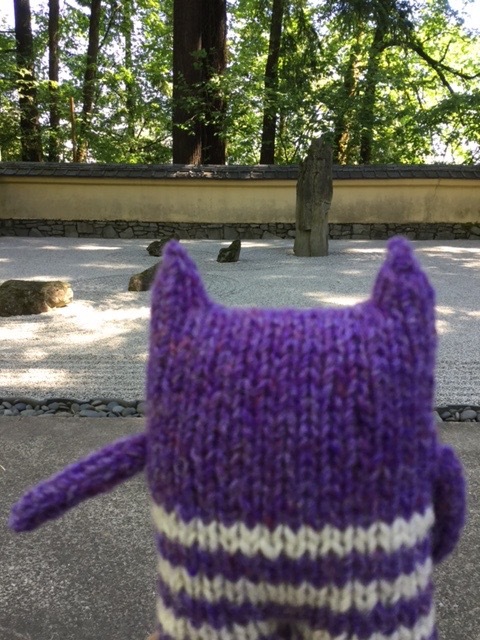 Our first stop was the Flat Garden situated just outside a gorgeous wooden pavilion with authentic sliding shoji doors. Finn felt his tininess in the universe here. After being put into perspective, Finn moved on to have a moment of Zen at the Sand & Stone Garden where workers rake circular patterns in the sand. For a moment Finn was reminded of the Celtic circular art on the Newgrange kerbstone and felt a bit homesick. He quickly got over his moment of nostalgia when he heard the sound of water. In the Strolling Pond Garden he enjoyed walking back and forth over a wooden boardwalk and even made some new friends. Finn got rather excited when he heard there was a tea garden. After all, what Irishman doesn’t love a good cuppa? 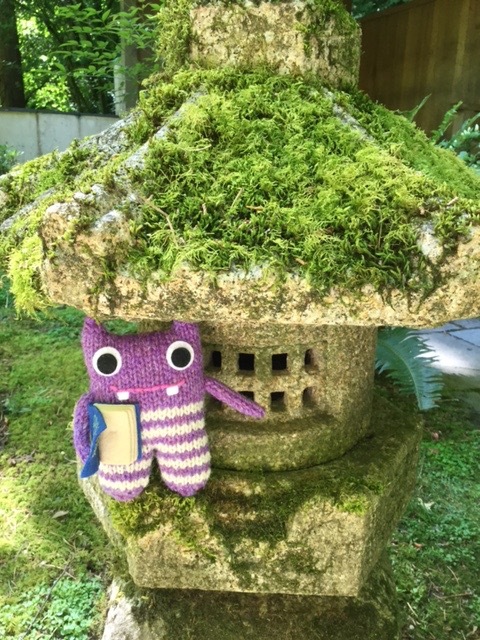 He was a bit disappointed to find out the Tea Garden is only used for traditional tea ceremonies, but he did think it a rather pretty place to explore. All that was left was the Natural Garden, but as the garden was a bit crowded that day, he didn’t find any good photo opportunities. However, a bit later he did find a nice pagoda to get out of the sun for a bit. After leaving the garden, Finn enjoyed the scenery of Portland’s Washington Park as we headed down to the always delicious Elephant’s Deli for lunch and a birthday pint. 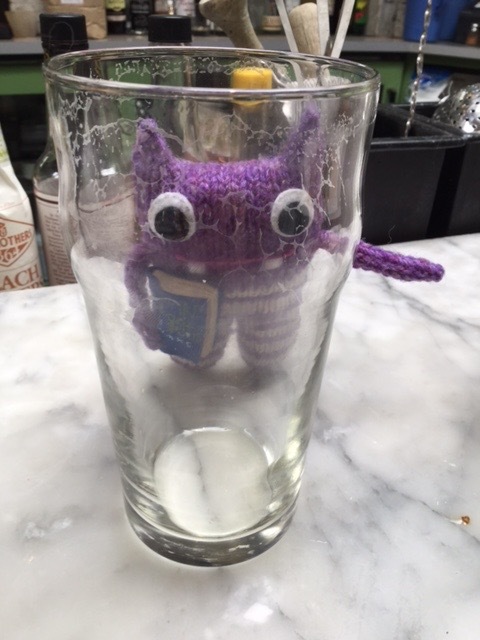 Needless to say, at the sight of the beer, Finn McSpool quickly got over not getting tea earlier and helped himself to a few sips. Finn, I said you could have a FEW sips!!! Well, after such an exciting day (and after all that beer), once we got home, Finn was ready to say goodnight. 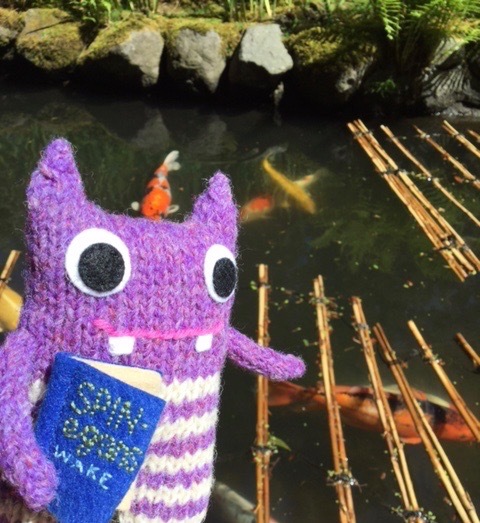 Finn will definitely be having more adventures, so be sure to stay tuned! And if you want to say “hello” to Finn, leave a comment and I’ll be sure he gets it. Tammie Painter is the author of The Trials of Hercules and an artist who dedicates herself to the tedium of creating images with colored pencil. Click Here to learn all about her first solo exhibition. Hahaha! He did well to stay up as long as he did – but I suppose the excitement of being in a new city has that effect on us all! Great! I’ll add “entertainment director” to my resume.